Quae fata immineant antè videre. Where the holy Nile will break its banks among the fields, the provident Crocodile lays her eggs in the open, in the overflow, teaching us a good lesson: To look ahead to see what the fates may threaten. Heu quàm praecipiti mersa profundo. tur, atque ita ova arida & inhumecta conservent. 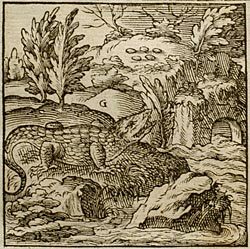 The crocodile, which gets its name from its fear of saffron, is a deadly evil, a dangerous quadruped in both elements - on land and in the river. Lacking a tongue, [p.97] but with jagged teeth, jam-packed in rows like combs, it cannot move its lower jaw-bone; its claws are prodigious, and its skin so impossible to damage that it is unharmed by a rain of blows no matter how painful, and they bounce off its back. It marks out a site for its nest by some sort of sixth sense and natural foresight, selecting the spot that will be the high-water mark of the Nile’s flood that year, and nowhere else will it lay its eggs, which are white like a goose’s. These things about the Crocodile are taken from Pliny, bk. 8, ch. 25; Solinus, ch. 45; Ammianus [Marcellinus], bk. 22 and Herodotus’ Euterpe. Plutarch adds in his book on Isis that the Egyptians inferred where the high-point of the Nile’s flooding would be from where the female had hatched their eggs: for since Crocodiles are unable to keep the eggs warm in the damp, and fear to lay them far from the river’s channel, they foretell by a silent instinct of nature where it will be, so that they can make use of the proximity of the river in laying and incubating (which the male and female take it in turns to do), and so keep their eggs dry and out of the damp. We are advised by this to take good care of things, and to take thought and foresee, well in advance, what we should decide or do. 1. Jacob van den Eynde (aka Eyndius): landsadvocaat (the lawyer who represents the province) of Holland (d. 1570). 2. The prose explains that through foresight and natural providence the crocodile lays her eggs each year at the exact spot where the Nile will rise highest. 3. Pliny, Natural History, 8.25.37.89. 4. See Emblem XIIII ([FJUb014]). 5. De Iside et Osiride, 75.381B-C.